Above: Dark Chocolate Truffles. Photography by Eric Swanson. The better the chocolate, the more flavorful your truffles will be, so choose a style you really like. In a double boiler (or a bowl resting on top of a small saucepan of simmering water), stir the chocolate until completely melted. Remove from the heat. In another saucepan over medium-low heat, warm the half-and-half or heavy cream but don’t let it come to a boil. Remove from the heat. Stir the warm chocolate into the cream and combine well. Pour the mixture into a bowl, cover, and refrigerate until set, about 2 hours or overnight. Scoop out about a tablespoon of chocolate and roll it into a ball. Repeat, placing each ball on a cookie sheet lined with waxed paper. 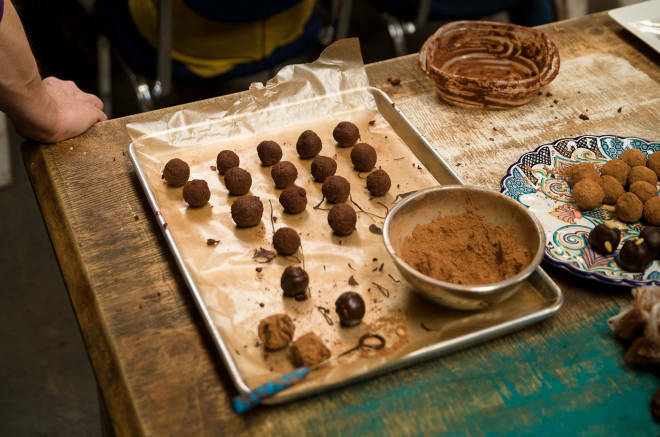 Roll the balls in cocoa powder and serve immediately.